Garh or Gad in Marathi or Hindi language means a Fort, and Sinha means Lion. Once known throughout the state for its magnificent architecture, Sinhagad Fort had been ravaged by the travails of time and today stands mostly in ruins. 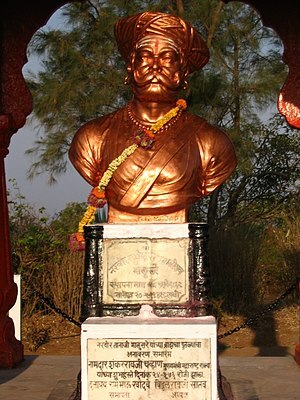 It had been a mute witness to a number of battles, the most memorable being that in which Tanaji Malusare, a general in Shivaji‘s army, had recaptured the Fort and laid his life in doing so. According to a famous folklore, it is said that it was in Tanaji’s honour that Shivaji, the strongest king of the Marathas, had renamed the fort from Kondhana to Sinha-gad, saying that the fort had been captured but the lion was lost. However, my research shows that the name of the Fort was changed BEFORE the historic battle of Sinhagad in 1670. 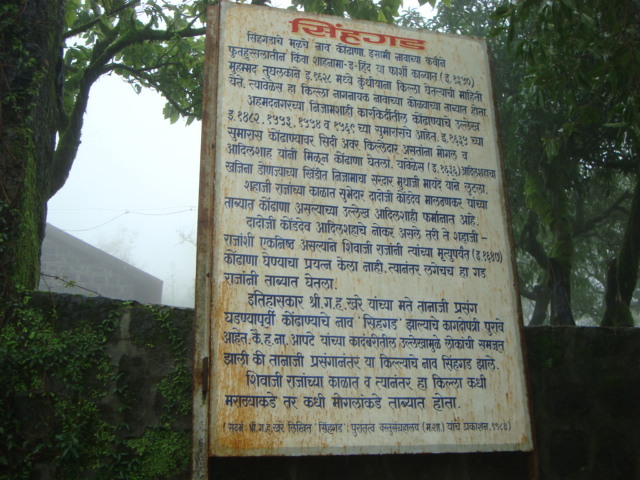 This placard states the history of Sinhagad Fort. It says that according to a Farsi historic document, Shahnama-e-Hind, the Kondhana Fort was taken over (purchased) by Mohamed Tughlak in 1628, though its mention has been made for as early as 1482. During the times of Shahaji Raje (Shivaji’s father) subhedar Dadoji Kondev was in charge of the Fort. This was the reason that Shivaji didn’t attack the Fort till Dadoji’s death in 1647, because Dadoji was close to Sahaji Raje. According to the historian, Mr. G. H. Khare, there are documents indicating that the fort was renamed to Sinhagad BEFORE the Tanaji incident. But due to the famous novel written by H. N. Apte, people started believing that the fort was renamed in honour of Tanaji Malusare. Sinhagad Fort stands perched on a hill, at an altitude of approximately 700 metres above the landscape that surrounds it. The height at which the fort stands has resulted in its being a very popular trekking destination among the adventure enthusiasts. Many Puneites go there, some every week. It is also a difficult drive up the steep road, and many people believe that if they can drive up there, they can drive on any road. There are several different ways of reaching Sinhagad on foot, the longest and the most difficult is the one that starts from Katraj. First-timers are usually advised not to take this route because it tests the stamina, endurance, and resolve of the trekkers. The route from Katraj spans seven different hills and hillocks over 20 kilometres before merging into the road to Sinhagad. This route usually takes around four to six hours in the daytime, and eight hours during a night trek. The trekking parties usually leave from Katraj at night, or early morning to avoid the scorching heat. 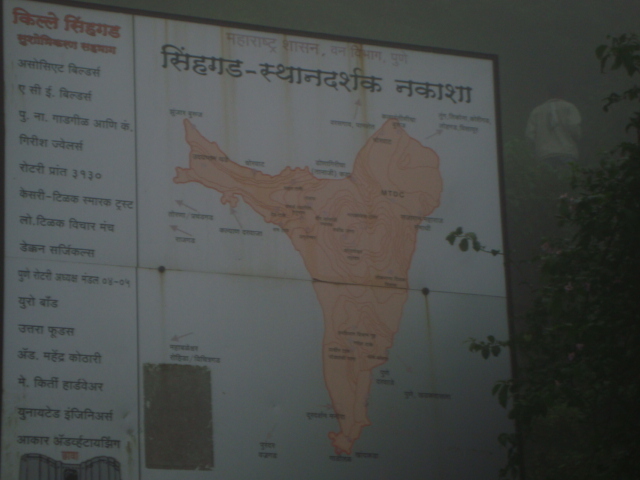 This entry was posted in Pune, Research and tagged Dadoji Konddeo, Dadoji Kondev, Katraj, Maratha, raje shivaji, Shivaji, Sinhagad, sinhagad fort, Tanaji Malusare, travel. Bookmark the permalink. Reblogged this on Enhance Profit's Blog.